Posted on 2018-12-01 13:10:57 GMT+0000 by Neil Godfrey. This entry was posted in Josephus and tagged Josephus, Pontius Pilate. Bookmark the permalink. I agree but someone does also the case that Pilate was introduced to remember as even a so “good” gentile Governor had need of an expiation by killing the Son of God. Whereas the tradition of a Herod having Jesus killed is to remark the not-expiation (and therefore the final condemnation) of the Jews as killers of Jesus. 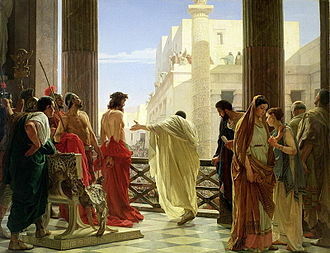 So in Luke the fact that Herod doesn’t kill Jesus (even if having the possibility by Pilate himself) is sign of the his not-expiation, while the fact that Pilate was the final killer goes to purify just the gentile Pilate (=the Gentile world is purified by the blood of Jesus and not the Jews). @Giuseppe I think that’s a valid point. That seems like the answer to me, that Titus preferred Josephus because he was “one of the region’s prominent aristocrats” and offered “a mature political analysis” and wrote “from realist premises” (and while of course flattering them). There is a difference, I believe, between flattering the reigning emperor for the sake of self-preservation and maintaining one’s standing in society on the one hand, and giving a more “neutral” account of Roman military actions in Palestine on the other hand. In the case of the latter Josephus can be understood as demonstrating that his fellow Judaeans are “up to” the Romans and can hold their heads high despite ultimate defeat, a defeat that was really said to be the fault of wicked extremist elements. Yes, in that particular respect he does also honour both sides.